WIN #28: Two Buff Willow Wicker Storage Chest Baskets from Choice Baskets. Win Two Lined, Buff Willow Wicker Storage Chests in Standard and Deep from Choice Baskets worth £54.95! In 2004, Corinne, the owner of Choice Baskets bought an established business selling basket ware and gifts, she didn't know a thing about baskets then, but has come a long way since. Choice Baskets have five main suppliers and will only sell good quality basket ware. Choice Baskets sell their baskets individually to give their customers more choice, with their prices being competitive with the larger suppliers. 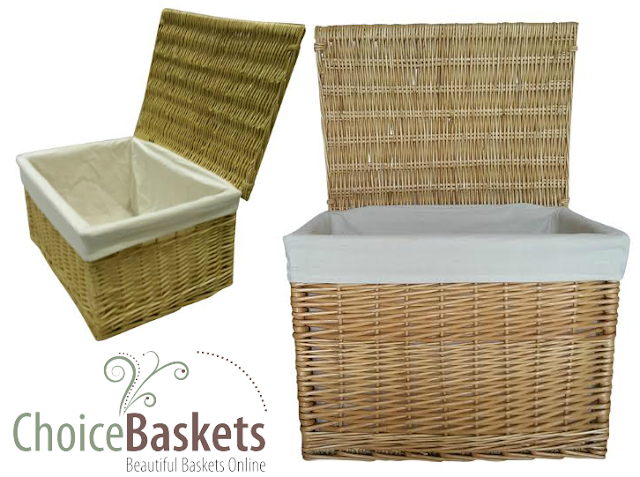 Choice Baskets have very kindly put aside two Buff Willow Wicker Storage Chest that are lined for one lucky reader/visitor to win! The winner will receive the basket, in both the standard and deep size worth £54.95! These baskets are exclusive to Choice Baskets, and the addition to the lid makes the baskets even more versatile. The baskets have a removable cotton lining, and faux leather hinges. ALL ENTRANTS PLEASE NOTE: By entering the competition, you agree, that I can pass on your email address to Choice Baskets! Please note: You must follow or like Unique Young Mum and Choice Baskets on at least one social media platform! To find out more about Choice Baskets and to view their full range of baskets, check out the official website here. The prize of this competition is Two Lined, Buff Willow Wicker Storage Chests in Standard and Deep from Choice Baskets worth £54.95! No alternative prize will or can be provided. There will be ONE (1.) winner who will win TWO (2.) products. By entering this competition, you agree for me - Jade Lewendon, to pass on your email address to Choice Baskets upon their request, once the competition has ended. Entrants MUST follow the two providers on at least one social media platform. For example, follow Unique Young Mum and Choice Baskets on Twitter, or like both companies on Facebook. Entry to the competition should be made via Rafflecopter. Only one entry per person/email address/IP address. Competition starts on 14th September 2015 and ends on September 28th 2015. Any duplicate entries will be deleted, and all entries will be verified so please do not try to cheat. Any cheaters will have all their entries removed from the draw, and their IP will be banned from entering the competition again. Winner will be notified by email, so please make sure all your details are correct. If you think you may of made a mistake, please email me on admin@uniqueyoungmum.com with the correct details. Winner will have SEVEN (7) days from the date they've received notification to claim prize. If I hear no reply after the 7 days are up, I will redraw the competition.